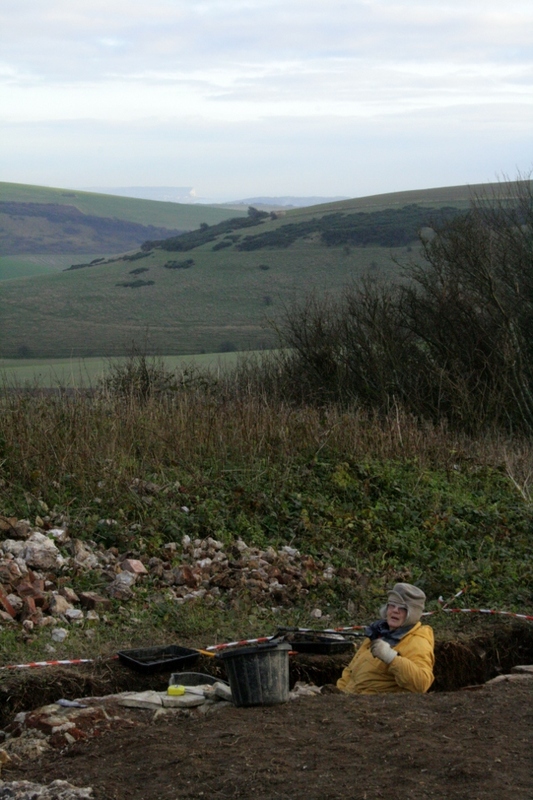 Looking SE at the base of the fireplace and Seaford Head beyond. Looking NW at SE corner of cottage. Sunday was another cold dry day, and the sun even popped out for a quick visit from behind the clouds! 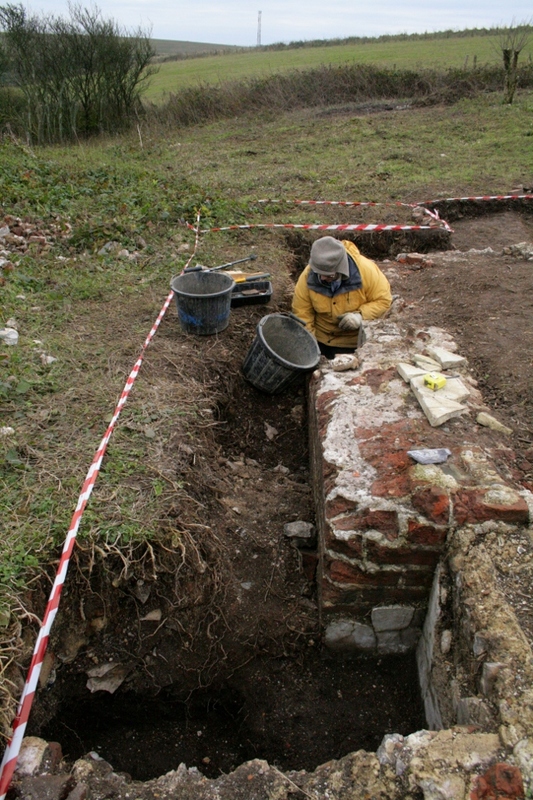 Some good digging was done in a very narrow slot along the southern half of the outside of the east side of the cottage. 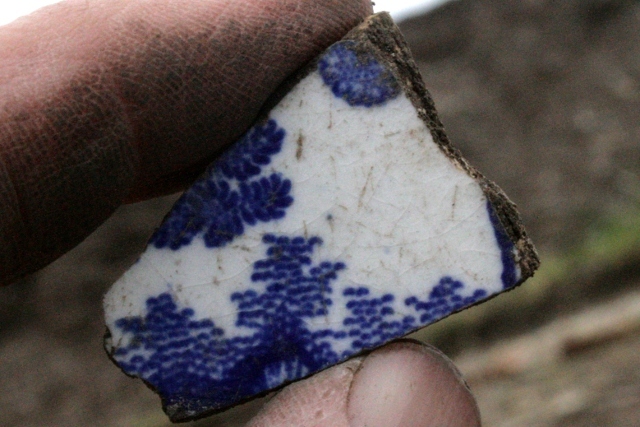 This was down through the demolition rubble fill to the original ground surface. The demolition fill against the outside of the east wall of the cottage, between the base of the chimney breast and its south-east corner, was fully excavated. 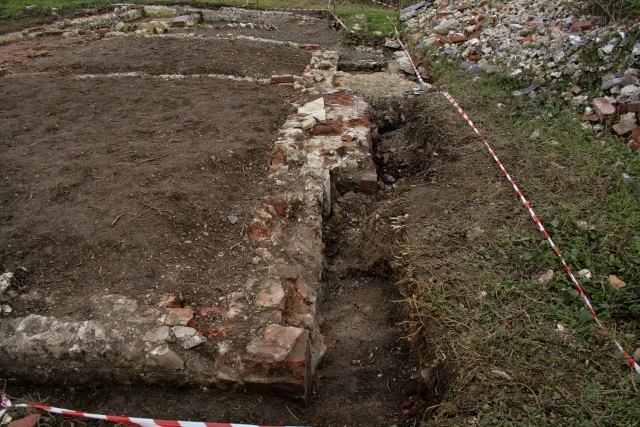 The full extent of the damaged section of the wall was revealed, and included a small crater in the ground surface matching that of the wall. 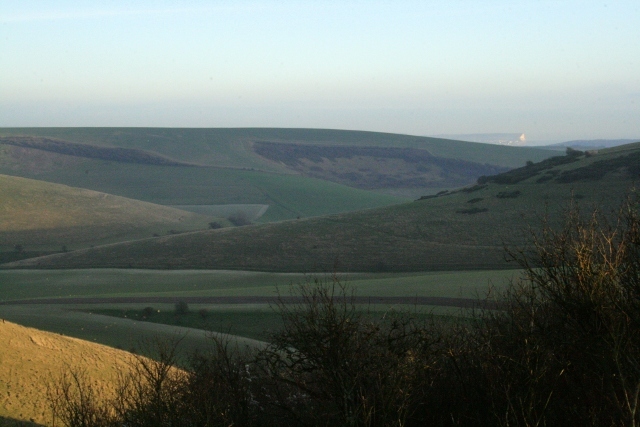 Because the cut of the crater had a sharply defined boundary, and was entirely filled by powdered brick, mortar, and flint, this was almost certainly caused by second world war ordnance. 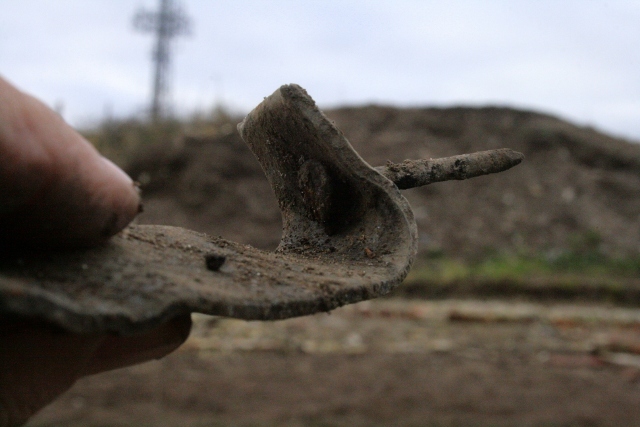 However the type of ordnance used was not able to be determined for no shrapnel was found (or perhaps, but unlikely, found but not identified). Whilst a metal detector could be used to search for possible shrapnel targets, all other such ground surfaces contained a relatively high density of rusty nails and other metal – both ferrous and non-ferrous – objects, such that a metal detector is of little use. Looking S at southern half of E side of cottage. Looking S at gap between bases of ‘laundry copper’ and chimney. Looking N at gap between bases of chimney and ‘laundry copper’. 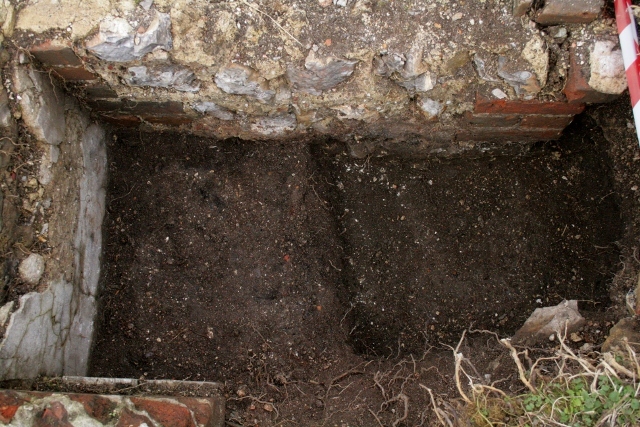 The gap between the base of the laundry copper and the chimney breast had also been partially excavated. 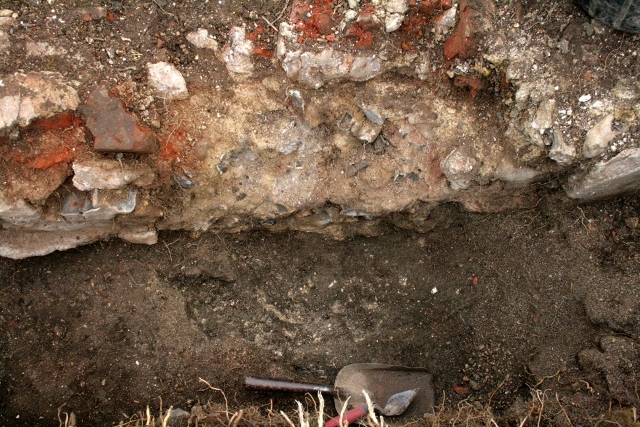 The intention, as with most of all the other areas dug, was to excavate down to the base of the demolition rubble layer. However, this has not always proved easy to do because both finds and small quantities of building material occured in the soil immediately below the upper context. 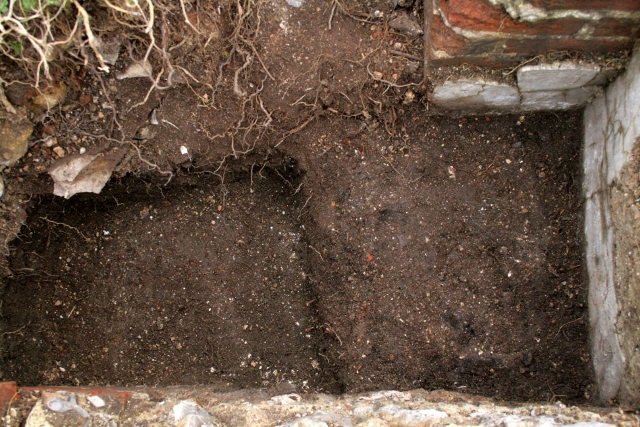 Therefore the eastern half of the gap between the base of the laundry copper and the chimney breast, which had been partially excavated down below the demolition fill, was further cleaned up down to the bottom of this soil fill of the cottage’s foundation trench. This fill was of a relatively uncompacted dark soil, coloured by the relatively high concentration of charcoal, small fragments of both burnt and unburnt coal, and rusty nails which it contained. Therefore this area had probably been used as a dump for ash from the cottage fireplaces, and at least some of the wood burnt was that of almost certainly previously used timber. The burnt material was not deposited there by the later bulldozer, for it was under (not over, or in) the demolition fill. 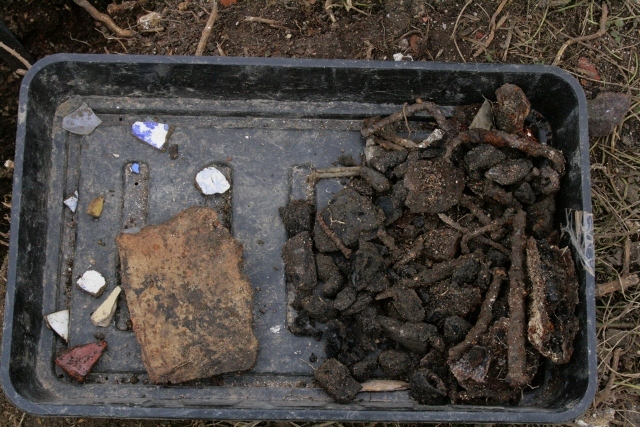 Finds tray from E side of cottage, S of chimney. 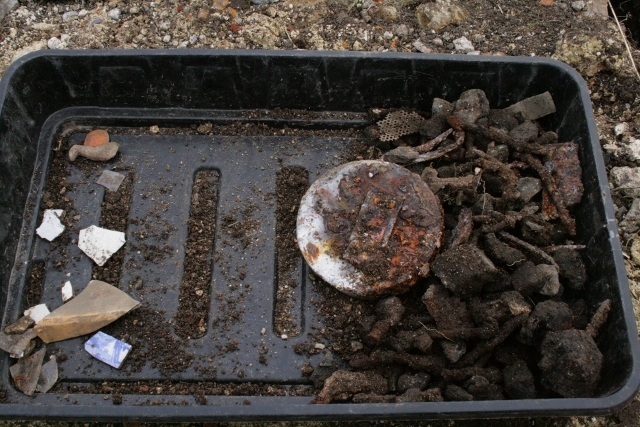 Finds tray from E side of cottage, N of chimney. 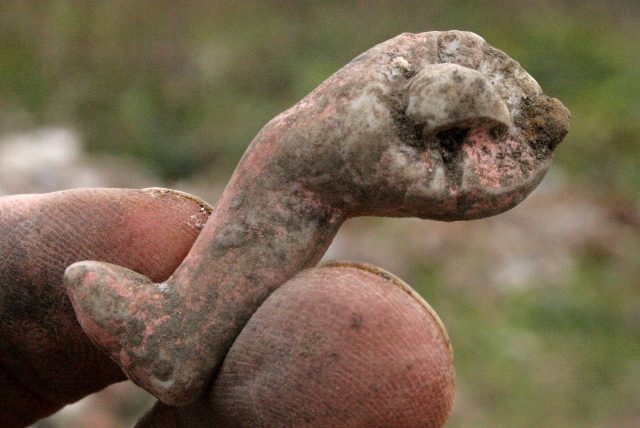 The doll’s leg matched that of an arm found a couple of metres to the north earlier in the dig. Relatively little glass was found, either window or bottle. Also, a lack of military finds was another big difference. 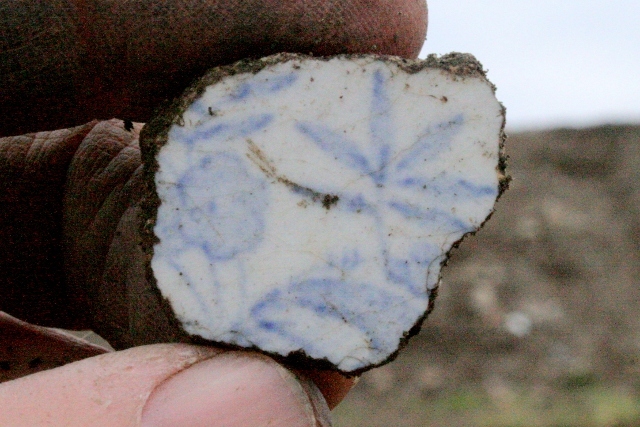 Our finds are clearly unevenly distributed across the site. 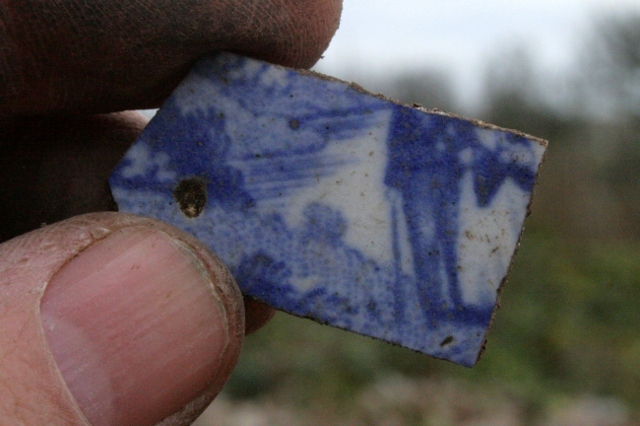 I look forward to finds analysis after the dig – changes in what, where & when things were dumped can tell a lot about changing patterns of behaviour over time. Panorama looking W at dig site; click for enlargement. 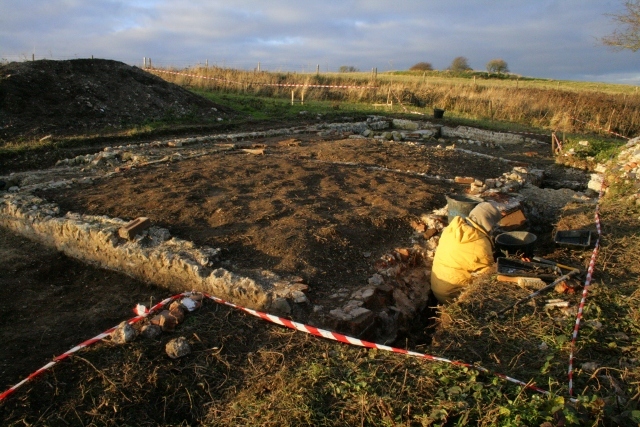 Looking E from dig site.